Everyone against the flying weirdo ! Where is my herbicide spell ? Extra: Special bundle available with GBA-GC connection cable. Also the game soundtrack was offered as a pre-order bonus in some countries. I can't start this review without inserting a personal note about myself and the game. Perhaps it would have been wiser to finish with that note because it sums up pretty well my feelings towards the game, much like the overall score does, but to start with it will somehow help me to emphasize my impression of Final Fantasy Crystal Chronicles, and to set things straight. Two things about me that I'm quite sure I share with many of you: I like RPG very much, Action-RPG as well, and when I write about a game, I like to finish it before giving my final opinion. Easy then to deduce I like finishing RPG, one of the most involving genres. I've had Final Fantasy Crystal Chronicles for almost a year now and (here comes the statement that tells a lot) I haven't finished it yet. And I probably will not finish it. Not that I can't, I'm at the last level I think, I had plenty of opportunities to play , but never again did I find the motivation to push forward. It doesn't give me fun anymore. The problem is that I'm not sure it ever did, and that's where the review really starts. Flashback. Final Fantasy was supposed to change everything for the GameCube, to be something totally unique, never seen before, these words came from the own mouth of Hiroshi Yamauchi. It's almost been his last deed as the president of Nintendo, mostly because The Game Designer Studio was supported by the Q Found he established for specific game development on Nintendo consoles. Square, Final Fantasy were back on a Nintendo system, it was like the return of the Messiah, like if suddenly the reason why Sony's consoles had been outselling Nintendo's for the past years had been found and destroyed. Something was about to happen that would change the future of the console forever, and for the best. 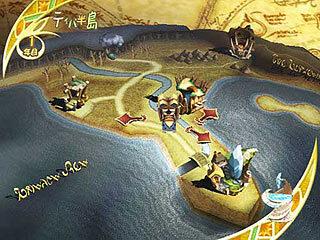 However, the more the features unveiled, the more the dream collapsed. 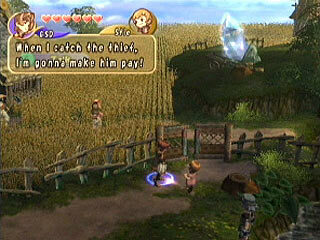 Only the game makers still had this genuine belief this title was everything a RPG-fan could ask for. 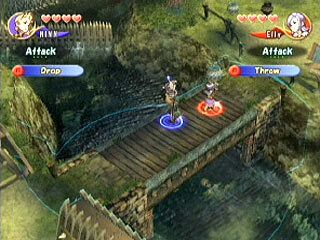 First, unlike other Final Fantasy, Crystal Chronicles would be more action oriented and as such would have real time battles, not turn-based. This actually sounded like a treat because of great classics like Secret of Mana and Phantasy Star Online, but more and more the game was introduced as a far-away spin-off of the Final Fantasy series, so much as to wonder if the game would have anything else in common but bearing the famous title. Then, we started to realize Nintendo was emphasizing very much the Game Boy Advance connectivity. Little did we realize that the game was so heavily built around the connection that it was not anymore introduced as an additional feature but as the reason to make the game. And then, also, there was the development, not to be handled by Square-Enix teams, but by a subsidiary, The Game Designer Studio, whose actual status remains unclear: does it really belong to Square or is it more of a Nintendo studio ? 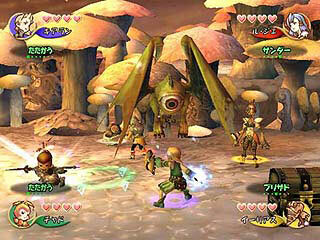 Added to the fact Nintendo would publish the game, and one started to have the feeling something fishy was going on, like if Nintendo was finally carrying most of the project alone, while Square-Enix tried its best to get as little involvement as possible to focus on what it really cared about: to make games for Sony's Playstation 2. When playing the game for the first time, the spirits were high though, you don't have all these doubts in mind. But it doesn't take long before they come back and overshadow your impression. From the cinematics, lacking explanations, to the menus, empty and unclear, it's difficult to feel at ease. There is an attractive atmosphere, thanks to very sophisticated graphics and music, but it seems strangely detached from the player. The first thing you know is that you've been set on the road, yet you don't even know who you are and hardly understand what's happening. Explanations and the art of driving the story are poor, it's a feeling that never leaves you throughout the game. Creating your character is also one strange moment, you choose from 4 different races then define him or her according to its clothing, job and taste. This creation process is somehow the first big mistake of the game, because your character is never more than a combination of these elements and as such doesn't have any personality, any life. 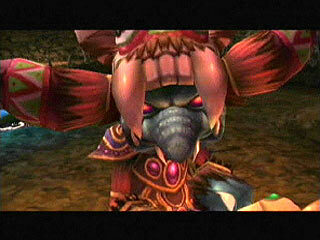 And this indeed, from the very beginning, makes Crystal Chronicles a not engaging game to play. 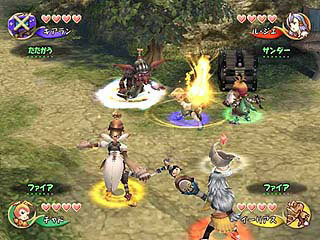 At any time in the game you can create a new character and hold as many as eight. This too is another weakness, there's no logic why one would need so many characters. Even in multiplayer it doesn't make much sense to have so many entries, while alone it's definitely confusing and useless. You don't really need different characters to beat the game and the more of them you create, the more time you will need to spend to increase their power to keep them even, often by revisiting levels. Focusing on one character allows you to grow one strong individual which is enough for the rest of the game. Besides, the game system is so badly done that it gives you absolutely no interest in making more characters, unless, of course, you play with a Game Boy Advance. 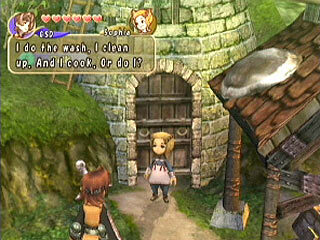 By "game system", I mean all the elements that make the gameplay of a RPG, such as all the different menus, the experience system, how to deal with merchants, etc. 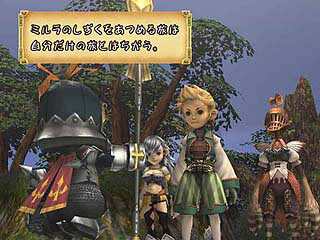 The makers of Final Fantasy Crystal Chronicles did try to offer something different, but they failed miserably. For instance, the experience has been simplified so that when you finish a level you can directly increase your stats a little, in other words, the experience is not really taken in account. 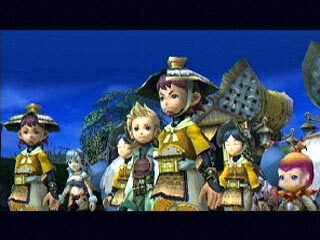 Armors, weapons and other items is also one of the most frustrating and annoying part of the game, personally I absolutely hated the way the game deals with it like I hated the boring and useless time I spent in villages, normally one of the aspects I cherish the most in Action-RPG. Everything is just so simplistic: you can equip very few items and you rarely get new ones because they are very expensive (or you are very poor) and you also have to provide materials to the craftsmen ! This last point could have been a good idea (it was in Secret of Evermore which used a somewhat similar system for magic), but it's just merely one more frustrations. Just think what buying a new item implies: you must have much money, you must have found the required materials, you must be sure your race can use the item, and let's not forget you must be sure your current item is not better, because you only know what it does once you bought it ! The magic is weak too, very few spells which never change. As I was saying earlier, do not expect more comfort from the villages. The joy of exploration and conversation is nonexistent. There are some beautiful places to visit, but their real size is deceptively small and everyone is boring, you never feel like talking to them twice because basically, they have nothing to say. Another important point is that you cannot enter houses at all ! You can't interact with objects, open closets and such, you can't do anything but talking to boring people. That is how limited the game is. 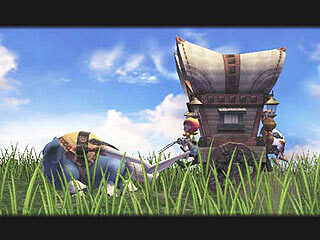 Actually, there is an exception, there is one house you can enter, it's Moogle's house. Moogle is a species of short furry critters who help you a little in your quest, one of them is carrying the chalice when you play alone, and you can also visit Moogle's house. There are several of these tiny houses in the world, but all of them are strictly identical ! The only two things you can do there is to get a stamp on your card, pointless if you don't own a Game Boy Advance (eventually allows you to play some mini-games), and to cut Moogle's hair. Boring, pathetic, think of the adjective you like to describe this waste of time. Now you may wonder what the chalice is because I failed to present the story yet; this is understandable, given that it's mostly here to justify the gameplay. The game pace is strange and this is because of the story. You and your companions (if you bothered making them) have to travel the world in a caravan to collect the drops from the myrrh tree. These drops feed the crystal of your village and the crystal in return protects your village against a deadly miasma which covers the whole world. 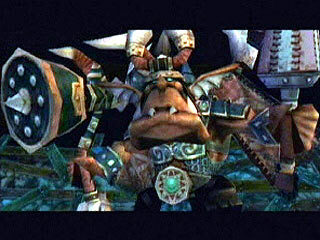 This trip takes place every year, thus the game is divided into levels and years: when you finish a level by defeating the boss, your chalice gathers a few drops of myyrh, and when your chalice is filled, after four levels, the year ends, you are automatically sent back to your village and can watch the celebrations and the, once again boring, re-reading of your journal, where most events of your travel are inscribed. Events include some random cinematics, meeting with other caravans most of the time, tremendously pointless. The chalice follows you everywhere, even on the battlefield, to protect you against the surrounding miasma. And that is where their attempt to justify the gameplay lies: if you play in multiplayer, of course you are forced to stay on the same screen, so they thought of staying within the protection of the chalice. One could argue there was no need to explain anything, everyone always had to stay on the same screen in Secret of Mana and it worked perfectly fine without a reason. 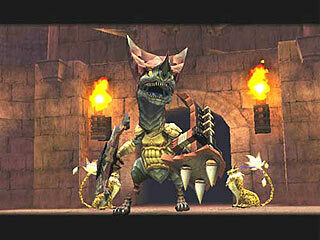 Besides, it's also responsible for one of the worst gameplay ideas of the game: someone MUST carry the chalice. That's what Moogle is for, but frequently he gets tired of carrying it and you have to replace him for a short time otherwise you can't move. That is one big fat stupid idea. Every once in a while the action is interrupted and you have to do this chore, like if you had to stop playing to bring the trash downstairs every ten minutes. The levels themselves are far from making the task smoother, another very irritating element is the view, a high top-view which considerably narrows the field of action. The graphics are perhaps beautiful, but the view greedily keeps them away from the player. Not to be able to see afar becomes terribly annoying in the vast levels (the marshes, the desert) later in the game, where everything looks so similar that you really have to draw carefully a map in your mind, or even better, on paper. At least one thing no one can deny is that Final Fantasy Crystal Chronicles is a gorgeous looking game with great musics. And yet... I personally do not completely agree with that either. There's not a single music which left a mark in my mind, I preferred what I heard in The Wind Waker (ah, the terrific boss music, Koji Kondo meets Ennio Morricone), even though I did enjoy several tracks. 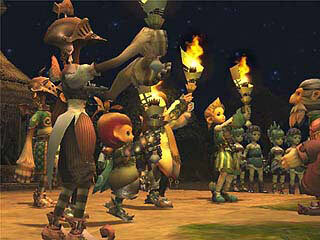 The musics are original, but less by what they express than by where they come from, Crystal Chronicles soundtrack has a feel of ancient world music with instruments you're not used to hear in a video games, some sound celtics, others from Middle East, or far eastern countries like Mongolia. It is very interesting, very nice and such a move deserves praise, but as for the pure musical enjoyment, it is not what I liked the best in a video game. In term of graphics, it's easier to be unanimous, it is beautiful, technically it pushes the GameCube very far, the visual and the light effects and costumes especially (they deserved an Oscar in their own right) are most impressive. My favorite "levels" in the game must be the brief miasma streams, there's nothing much happening, but at least here it makes sense, and it's one of the rare places of the game where you can actually feel a part of the atmosphere. But as I said I still have objections. No matter how beautiful the game is, there is this slight feeling of coldness, especially felt in the main characters, always smilling dully, which, without ruining everything, takes back something from the game, something most important which in spite of all the drawbacks could have earned the heart of gamers. Without it, graphical beauty lacks a soul. 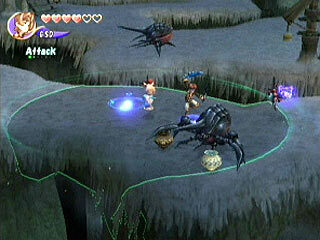 The main weakness of Crystal Chronicles is in the game mechanics, some of the worst I ever witnessed in a RPG and to speak frankly, one of the worst I witnessed in any game. It's not technically flawed, but it doesn't bring anything useful or interesting to the players. There are many original ideas in the game, things which do not play the way they do in other games, but the problem is that you really miss the old gameplay and RPG routine because all the new ideas are just bad. Some are only here to hide the lack of time spent on the development, like the view or the villages, others are just plain miscalculations, wrong choices, like the menus, the character creation, the use of the shield or the Game Boy connectivity. A couple of examples again before concluding, because examples speak the truth. Take the magic: when you cast a spell, there must be nothing between you and the creature you're aiming at otherwise you can't reach it; this means you can't hit an enemy behind a small fence, a gap or a stone, no matter how close he is to you. What kind of magic is that which can only affect targets in clear view ? There's also the mail, it could have been a good idea to exchange mail, but the letters always arrive at the same time, at the end of the level, from the same persons, with the same kind of uninteresting speech and items you can easily get on the road. You forget to be excited about it after you get your first letter. 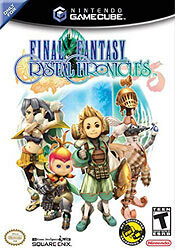 There is very little Final Fantasy Crystal Chronicles accomplishes succesfully, playing shortly a level or a boss battle is often enough to get the best of it. It is a failure, a promised game with very high expectations which falls from this same height, and breaks into pieces, on the player's hopes. It's a symbol of the year 2004 which has been a mixture of disappointment and good surprises, needless to say it led the disappointment pack. The game failed in bringing back Final Fantasy and Square-Enix to a Nintendo home console, failed in creating a convincing model for the Game Boy Advance connection, failed in opening new creative paths. It was a balloon filling with air until it exploded in our faces. The saddest part is that the game sold pretty well, better than many other better games on GameCube, and the only reason for this is because of two words printed on its box: "Final Fantasy". Simply because of these words the game got much more attention than it deserved. What a strange world. 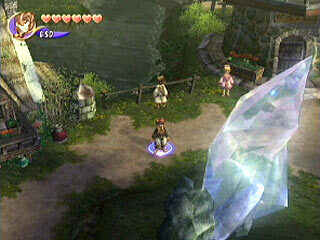 "In a world ravaged by plague, the people depend on a blessed crystal. In order for this crystal to maintain its sparkle and power, Mirula Droplets are constantly needed. 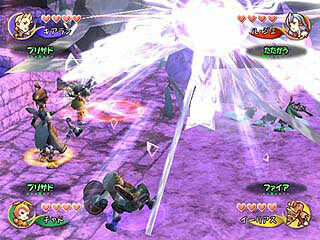 These crystallized drops can only be found in the deepest, darkest caverns of a far-off dungeon. 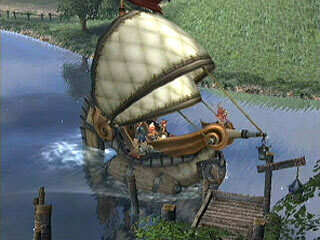 Every year, the Crystal Caravan must collect the precious Mirula Droplets, burdened with the fate of the villagers. This year, however, players and up to three friends must take the caravan that makes the vital excursion to save the villagers lives. As a long and perilous trek is taken through a wilderness overrun by monsters, players will fight through this epic role-playing game with the story and graphic quality fans have come to expect from the Final Fantasy series." "- Up to four players can play simultaneously, working cooperatively to solve puzzles and defeat enemies on their quest, using their Game Boy Advance systems to control their character data and view character information. - Fight through an epic role-playing game with the story and graphic quality players have come to expect from the Final Fantasy series! 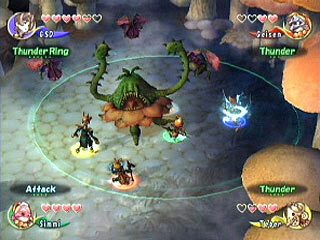 - Use magic spells and special attacks to combat amazing enemies in massive real-time battles!" Basically this game is really good, but unfortunately it is annoying as well because you have to lug a crystal around everywhere with you. Excluding that feature, this game is actually very entertaining to play and to watch. I have FF:CC and it's great. Though my friends have a hard time staying in the aura because our chalice boy keeps going the wrong direction, it's fun in multi. I ususally play in single because I can't find anyone else to play it with. Right now, I'm on year 12 (I'm not obsessed! Shut up!). 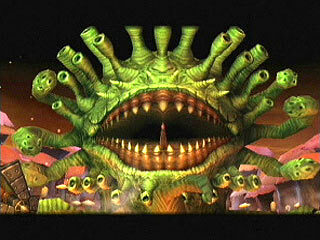 The monsters, the dungeons, and basically the whole game gets harder as you go throughout the years. My friend used an Action Replay on his and got to year 56. Even then it was hard for him to stay alive. If I were to rate this, which I have, multiple times, I'd give it a 50. Out of 5.